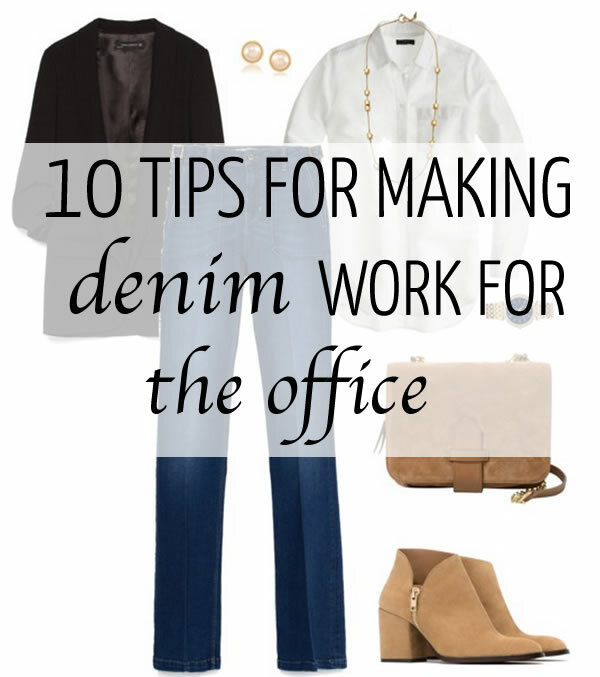 How to wear denim at the office: 10 tips for making it work! Wearing denim to the office is always nice. Not having to fuss with restrictive work clothes is a welcomed change and even though the break is nice, there are a few things to keep in mind. Here are 10 tips to help make denim work at the office. Trends do not always translate well in the work place, even on a dress-down denim day. Skinny jeans or exaggerated wide leg jeans are not the best choice. There are classic cut denim choices that look sleek enough to pass for cotton business pants. Go for those! Of all the washes of denim, dark is the most office appropriate. Light or acid washes can look nice, but not in the office. Dark denim is safe because it can act like a neutral palette and anchor an outfit, much like a black skirt or pant would. Make sure the denim you choose for work is ironed or dry cleaned. Wrinkles are off putting in general, but at the office, it’s even more of a faux pas. Be sure to launder and press or dry clean your jeans before you wear them to the office. Well fitted jeans keep your look clean. If tailoring will give you the perfect fit, it is worth the investment when it comes to the denim you choose to wear to work. A word of caution — you want your denim to fit well, but not be tight. This trick will ensure things don’t become too casual. A button down shirt, a pair of closed toed wedges or ankle boots are all great business wear additions. Adding a blazer would work as well. Keep everything other than the jeans, within the parameters of your office’s usual dress code. Try putting together a business outfit and then substitute the pants or skirt with a pair of classic cut, dark denim jeans. Pick your poison. A denim top or a denim pant will work. However, paired together they are a bit too trendy. Choose one item of denim to add to your outfit and keep every other piece of clothing business formal and professional. Attention should be paid to the length of the jeans you wear. If they are too long, you may look sloppy. Go too short, and you may look like you’re headed to a day at the beach. 9. Distressed is a don’t! This seems like a no-brainer, but it is worth mentioning. Holes, rips and frays should be avoided at all costs at work. Ultimately, you are heading into the office. The look you go for still has to reflect that you are a professional. Have fun, but stay within the appropriate limits. Shop the looks below to get your hands on some items that will work when wearing denim to the office.